The Santa Fe Flyer is a complete & Ready-to-Run HO Scale Electric Train Set from Bachmann which features an FT A-Unit Diesel Locomotive (Santa Fe). Retail $155.00 SAVE 34% ! The shipping was fast it came in a week. the engine runs smoothly faster than most locos. during purchase its best to get some straight track with it. Complete electric train set with one locomotive, two freight cars and a caboose. Bachmann's exclusive E-Z Track system (steel rails and black molded roadbed). 12 pieces creating a 36" circle layout. Track easily assembles! Snaps together and stays together on floors, tables, and carpets. No nails, screws or special tools needed. Smooth-running FT diesel locomotive with 8-wheel drive, operating headlight and metal wheels. 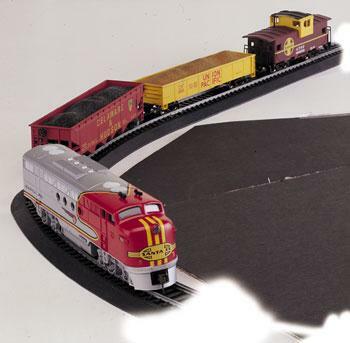 Freight cars and caboose are finely detailed with plastic wheels. Accurately molded plastic body shells with authentic paint schemes and lettering. Frame mounted E-Z Mate knuckle couplers on all cars.